Download "October 11, 2006 Appendix I-D-1 Page 1"
3 October 11, 2006 Appendix I-D-1 Page 3 set. Clicking these other actions will initiate related lists from the desktop computer and field computer, making them available for transfer. Once an Action is selected, the appropriate file on the appropriate list to be transferred is highlighted. This is true whether it is a job file, volume table or method set. Then one of the directional arrows in the middle of the window, indicating the direction of the transfer, will darken indicating it is enabled. Clicking the arrow will then commence the transfer process. Some transfers can only occur in one direction. For example, job files can only be transferred from the field computer to the desktop computer. Method sets should only be transferred from the desktop to the field computer. 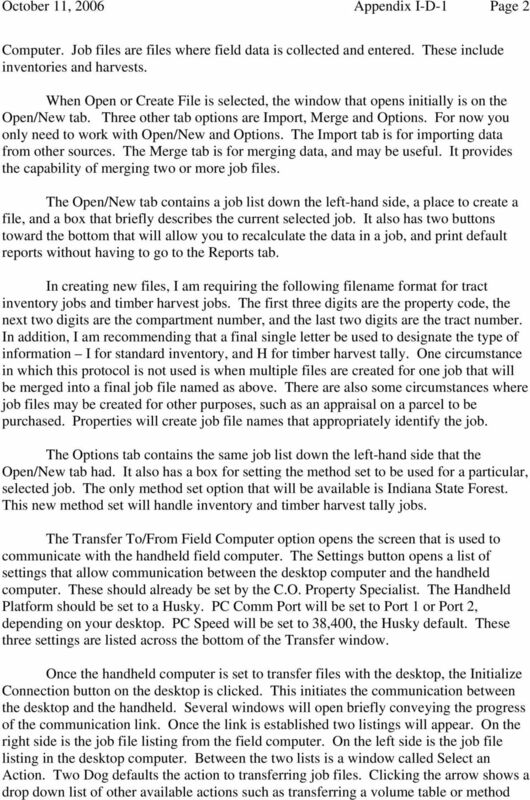 If a job file of a particular name already exists on the desktop, and a file of the same name is attempted to be transferred from the field computer, a window will pop-up and ask if the operator wants to overwrite the existing file. If the two files were intended to be different, this protects against eliminating a job file. In other cases, the transfer file from the field computer may be an update of the file on the desktop, so in this case it may be appropriate to overwrite the desktop file. 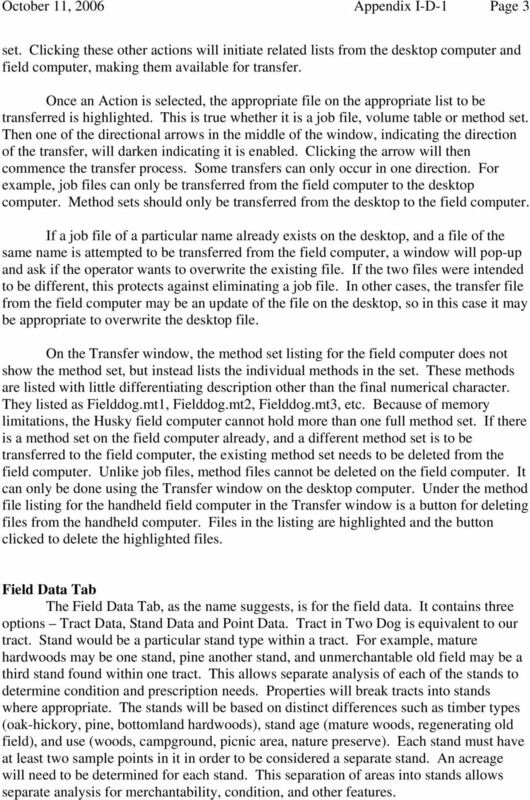 On the Transfer window, the method set listing for the field computer does not show the method set, but instead lists the individual methods in the set. These methods are listed with little differentiating description other than the final numerical character. They listed as Fielddog.mt1, Fielddog.mt2, Fielddog.mt3, etc. Because of memory limitations, the Husky field computer cannot hold more than one full method set. If there is a method set on the field computer already, and a different method set is to be transferred to the field computer, the existing method set needs to be deleted from the field computer. 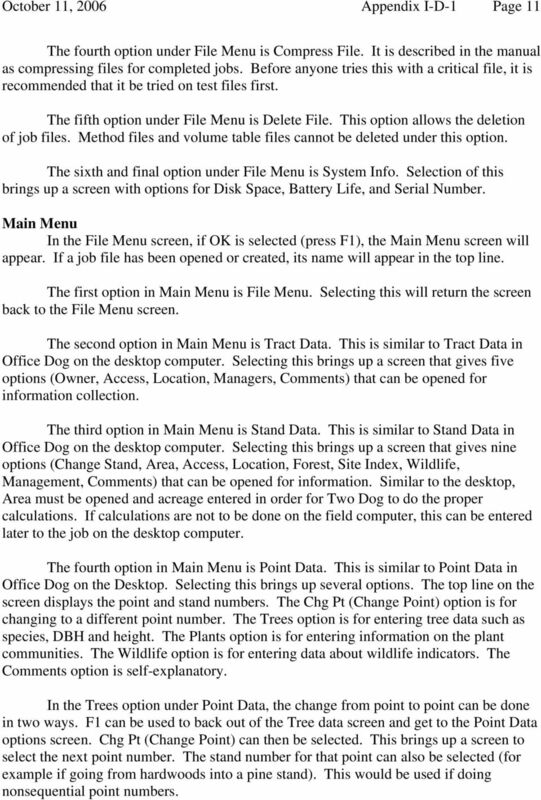 Unlike job files, method files cannot be deleted on the field computer. It can only be done using the Transfer window on the desktop computer. Under the method file listing for the handheld field computer in the Transfer window is a button for deleting files from the handheld computer. Files in the listing are highlighted and the button clicked to delete the highlighted files. Field Data Tab The Field Data Tab, as the name suggests, is for the field data. It contains three options Tract Data, Stand Data and Point Data. Tract in Two Dog is equivalent to our tract. Stand would be a particular stand type within a tract. For example, mature hardwoods may be one stand, pine another stand, and unmerchantable old field may be a third stand found within one tract. This allows separate analysis of each of the stands to determine condition and prescription needs. Properties will break tracts into stands where appropriate. The stands will be based on distinct differences such as timber types (oak-hickory, pine, bottomland hardwoods), stand age (mature woods, regenerating old field), and use (woods, campground, picnic area, nature preserve). Each stand must have at least two sample points in it in order to be considered a separate stand. An acreage will need to be determined for each stand. This separation of areas into stands allows separate analysis for merchantability, condition, and other features. 4 October 11, 2006 Appendix I-D-1 Page 4 The only information that you must collect is Point Data, with one exception. You can ignore Tract Data and Stand Data, except for acreage. However, it is strongly encouraged that you to at least look at them. In the future we will be using parts of them, and would like recommendations from field staff on which information should become the standard to be collected. Many of the data fields under Tract Data and Stand Data either contain drop down lists or allow the creation of drop down lists. These can be customized to meet our system needs. Whatever is chosen will be the same across all properties. The Tract Data option opens a window from a selected General Tab. This provides a place to insert an ID, which would be the property code, two-digit compartment number and three-digit tract number. A box is available to insert a date. Also there is a memo box for text information. Other available tabs under Tract Data are Owner, Managers, Access, Location and Comments. The Owner Tab is for landowner information. The Managers Tab is for information on the person managing. The Access Tab may have some utility as it provides a description for access to and within a tract. The Location Tab also has utility as it provides location information for a tract. The Comments Tab provides a box for text comments. The Stand Data option opens a window from a selected General Tab. This provides a place to specify a stand ID. 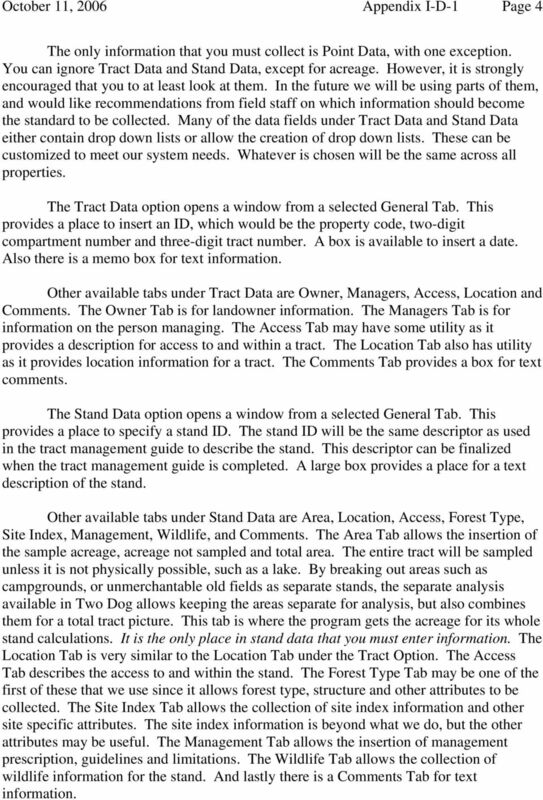 The stand ID will be the same descriptor as used in the tract management guide to describe the stand. This descriptor can be finalized when the tract management guide is completed. A large box provides a place for a text description of the stand. Other available tabs under Stand Data are Area, Location, Access, Forest Type, Site Index, Management, Wildlife, and Comments. The Area Tab allows the insertion of the sample acreage, acreage not sampled and total area. The entire tract will be sampled unless it is not physically possible, such as a lake. By breaking out areas such as campgrounds, or unmerchantable old fields as separate stands, the separate analysis available in Two Dog allows keeping the areas separate for analysis, but also combines them for a total tract picture. This tab is where the program gets the acreage for its whole stand calculations. It is the only place in stand data that you must enter information. The Location Tab is very similar to the Location Tab under the Tract Option. The Access Tab describes the access to and within the stand. The Forest Type Tab may be one of the first of these that we use since it allows forest type, structure and other attributes to be collected. The Site Index Tab allows the collection of site index information and other site specific attributes. The site index information is beyond what we do, but the other attributes may be useful. The Management Tab allows the insertion of management prescription, guidelines and limitations. The Wildlife Tab allows the collection of wildlife information for the stand. And lastly there is a Comments Tab for text information. 5 October 11, 2006 Appendix I-D-1 Page 5 The Point Data option is the current area of emphasis for the data collection. When this option is selected, the window opens to the Tree Data Tab. This is the screen where our standard tree data is entered. Other available tabs in this option are Wildife, Comments, Plants and Summary. Tree Data On the Tree Data Tab is a spreadsheet area with headings for the entry of tree data. The headings are Number, Species, DBH, Product, MHt and Defect. The Number field is a numerical identifier for the trees entered on this point. The program automatically inserts it. 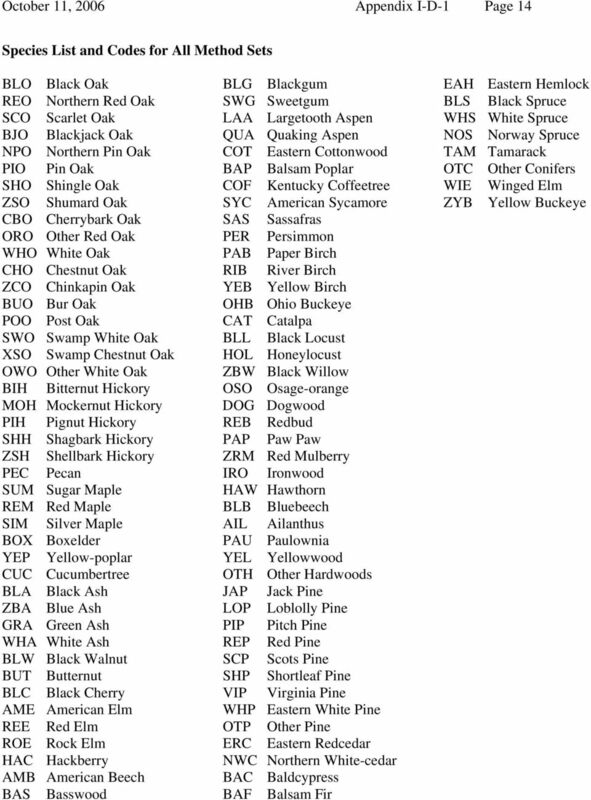 The Species field is the species code using the Purdue species abbreviation system plus some additional species not covered. If a box in this field is highlighted, you can click the mouse right button to get a drop down list of species. A warning will flash if the program does not recognize a code that is entered. If a point has no data, but should be counted as a sample point (a point in a field for example), enter.n (period and capital N) in the species field. A point can be excluded as a sample point, even if it has data, by entering.d (period and capital D) in the species field. See the manual for more information on.n and.d. The DBH field is the diameter at breast height to the nearest whole inch. This should accept diameters down to one inch. The program should warn you if the entered DBH is outside the specified range for a product (this may depend on the machine). The Product field is for the two-letter product code. This is very important information because it tells the program what to do with the tree. The cull and snag product classes require completion of information including DBH and height. These are important for some management considerations. The MHt field is for the merchantable height in logs. Depending on the product code, this log height may be 12 feet or 16 feet. The Purdue Doyle Volume Table for 12- foot logs was retained for all sawtimber trees and veneer trees. The volume unit is board feet. The merchantable height ranges from a half log up to six logs in half log increments. Poles have volume measured in cords, and culls and snags have volume measured in cubic feet. The minimum merchantable height accepted for these is one log. Both of these use volume tables with 16-foot logs. The merchantable height ranges from one log to eight logs in half log increments. The number of logs is entered in the merchantable height field numerically as a whole number without a decimal place. For example, a half log is entered as 5, one log is entered as 10, and two and half logs are entered as 25. Cull trees and snag trees are considered to have no merchantable volume, therefore they will not accept a defect percentage. For a harvest, if a snag is to be tallied with merchantable volume, it must be treated as a live tree, not a snag. 6 October 11, 2006 Appendix I-D-1 Page 6 The Defect field is for the percent defect estimated in the tree. The defect number is entered as whole number. For example, 25 is for 25% defect and 75% sound. In tallying trees for prime, the following method should be used. Record the prime tree as you would any other tree for Two Dog. It will be listed in the Two Dog totals for volume and number of trees. In harvests, the tree will be tallied the same way, and on notices the volume will be footnoted as volume in trees with prime volume. At the bottom of the Tree Data window are three identifiers. One identifier is Point Number. The box identifies the point number the tree data is located in. When entering data for a new point, click the Add button and the program will prompt you to add a new point number. If you want to check existing data, you can use the scroll bar to move among the points. Another identifier is the Stand Number. If we were using stands, we could specify that a particular inventory point is in an identified stand. This option has great utility because you can change the stand number or even first assign stand numbers after the field information is collected. 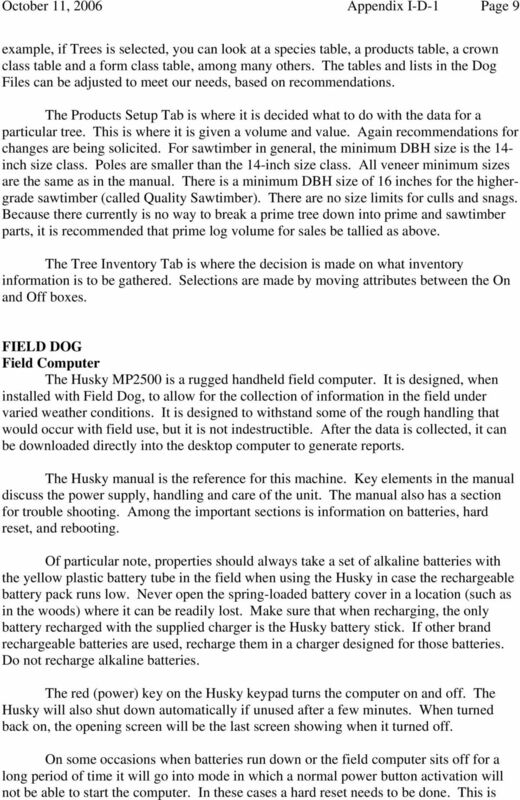 Point data can be collected in Field Dog without specifying a stand breakdown. Once the data is downloaded onto the desktop, the point data can be brought up and the points can be assigned to various stands in the office. The last identifier is Method Number. 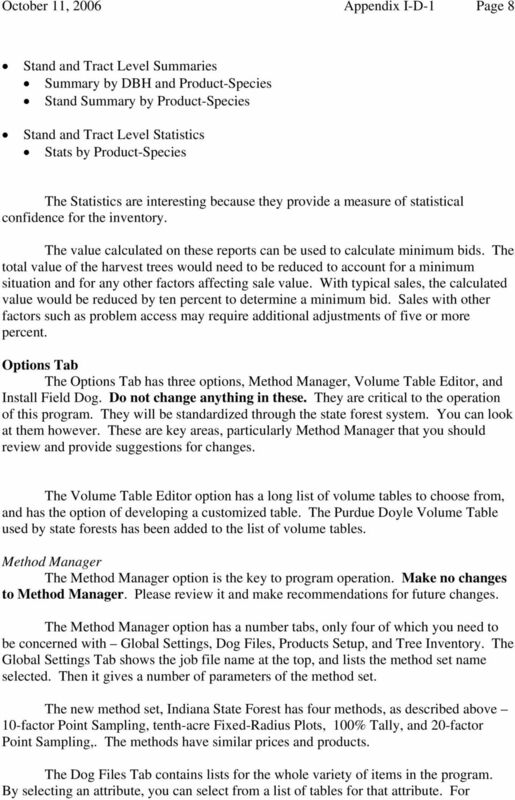 The new Indiana State Forest method set is the only method set available. This eliminates the need to switch method sets depending on whether you are doing harvest tally or inventory, as was the case with the previous method sets. This method set has four methods. A method set is distinguishable by the fact that all methods under it will use similar codes and parameters for species, products and other information. You could identify different methods from the same method set for different points in the tally. For example, if you are converting a pine stand to hardwoods using a clear-cut, you could use point sampling to get the volume and tree number estimates so you do not have to tally every tree. If there is a recent blowdown area within the stand that you cannot use point sampling on, you can use fixed radius plots. You could then specify which method is used on each point, differentiate the points into different stands, assign appropriate stand acreages, and the program would do the calculations accordingly. The first method is a ten-factor prism inventory method. It can be used for standard tract inventories. It can also be used for harvest tally in some circumstances. This could be a case of a homogeneous pine stand that is being removed completely. Rather than mark and tally every individual tree, the boundary of the removal can be marked, and the harvest area sampled for the sale estimate. The second method is a tenth-acre fixed radius plot inventory method. It can be used in circumstances when a prism inventory would not suffice. It can be used for harvest tally estimation in circumstances when there is storm damage requiring complete removal and there are many downed trees making prism sampling unworkable. 10 October 11, 2006 Appendix I-D-1 Page 10 done by holding down the Escape button, the up-arrow, and the power button at the same time for about five seconds. Software In basic mode, the Husky will provide a prompt C:\> and states to type FD for FieldDog. Typing FD and pressing Enter will initiate Field Dog. There is no reason to move back out of Field Dog. 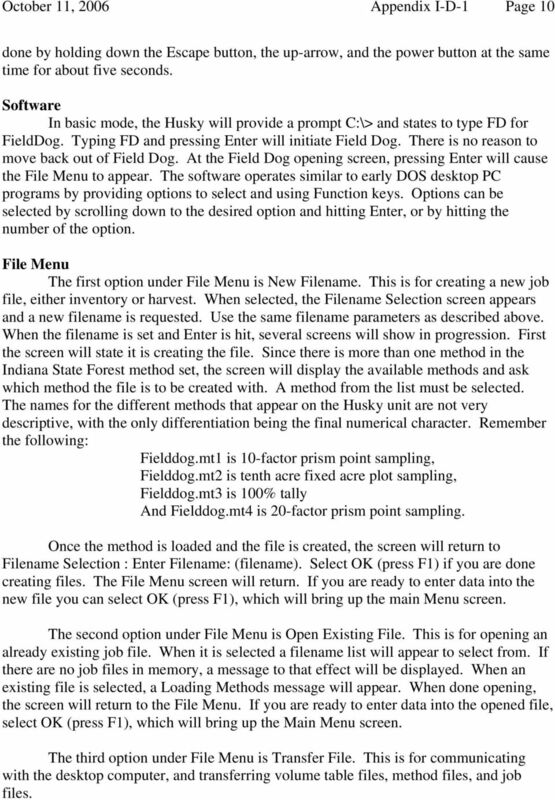 At the Field Dog opening screen, pressing Enter will cause the File Menu to appear. The software operates similar to early DOS desktop PC programs by providing options to select and using Function keys. Options can be selected by scrolling down to the desired option and hitting Enter, or by hitting the number of the option. File Menu The first option under File Menu is New Filename. This is for creating a new job file, either inventory or harvest. When selected, the Filename Selection screen appears and a new filename is requested. Use the same filename parameters as described above. When the filename is set and Enter is hit, several screens will show in progression. First the screen will state it is creating the file. 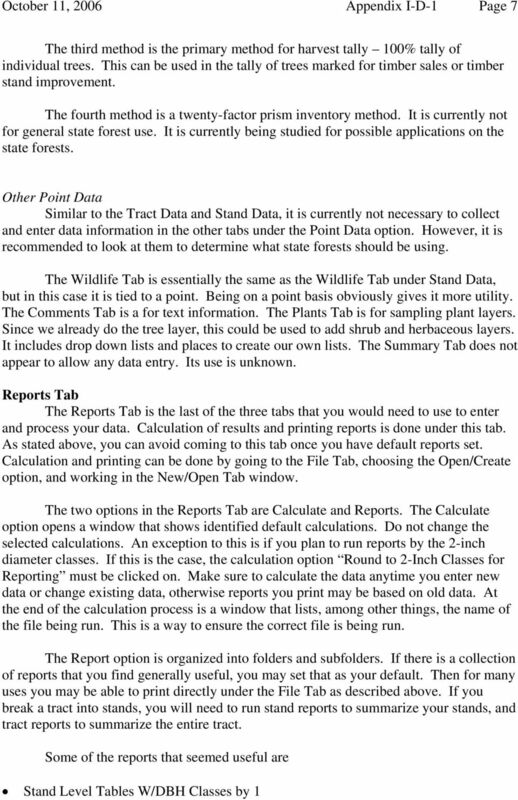 Since there is more than one method in the Indiana State Forest method set, the screen will display the available methods and ask which method the file is to be created with. A method from the list must be selected. The names for the different methods that appear on the Husky unit are not very descriptive, with the only differentiation being the final numerical character. Remember the following: Fielddog.mt1 is 10-factor prism point sampling, Fielddog.mt2 is tenth acre fixed acre plot sampling, Fielddog.mt3 is 100% tally And Fielddog.mt4 is 20-factor prism point sampling. Once the method is loaded and the file is created, the screen will return to Filename Selection : Enter Filename: (filename). Select OK (press F1) if you are done creating files. The File Menu screen will return. If you are ready to enter data into the new file you can select OK (press F1), which will bring up the main Menu screen. The second option under File Menu is Open Existing File. This is for opening an already existing job file. When it is selected a filename list will appear to select from. If there are no job files in memory, a message to that effect will be displayed. When an existing file is selected, a Loading Methods message will appear. When done opening, the screen will return to the File Menu. If you are ready to enter data into the opened file, select OK (press F1), which will bring up the Main Menu screen. The third option under File Menu is Transfer File. This is for communicating with the desktop computer, and transferring volume table files, method files, and job files. 11 October 11, 2006 Appendix I-D-1 Page 11 The fourth option under File Menu is Compress File. It is described in the manual as compressing files for completed jobs. Before anyone tries this with a critical file, it is recommended that it be tried on test files first. The fifth option under File Menu is Delete File. This option allows the deletion of job files. Method files and volume table files cannot be deleted under this option. The sixth and final option under File Menu is System Info. Selection of this brings up a screen with options for Disk Space, Battery Life, and Serial Number. Main Menu In the File Menu screen, if OK is selected (press F1), the Main Menu screen will appear. If a job file has been opened or created, its name will appear in the top line. The first option in Main Menu is File Menu. Selecting this will return the screen back to the File Menu screen. The second option in Main Menu is Tract Data. This is similar to Tract Data in Office Dog on the desktop computer. Selecting this brings up a screen that gives five options (Owner, Access, Location, Managers, Comments) that can be opened for information collection. The third option in Main Menu is Stand Data. This is similar to Stand Data in Office Dog on the desktop computer. Selecting this brings up a screen that gives nine options (Change Stand, Area, Access, Location, Forest, Site Index, Wildlife, Management, Comments) that can be opened for information. Similar to the desktop, Area must be opened and acreage entered in order for Two Dog to do the proper calculations. If calculations are not to be done on the field computer, this can be entered later to the job on the desktop computer. The fourth option in Main Menu is Point Data. This is similar to Point Data in Office Dog on the Desktop. Selecting this brings up several options. The top line on the screen displays the point and stand numbers. The Chg Pt (Change Point) option is for changing to a different point number. The Trees option is for entering tree data such as species, DBH and height. The Plants option is for entering information on the plant communities. The Wildlife option is for entering data about wildlife indicators. The Comments option is self-explanatory. In the Trees option under Point Data, the change from point to point can be done in two ways. F1 can be used to back out of the Tree data screen and get to the Point Data options screen. Chg Pt (Change Point) can then be selected. This brings up a screen to select the next point number. The stand number for that point can also be selected (for example if going from hardwoods into a pine stand). This would be used if doing nonsequential point numbers. 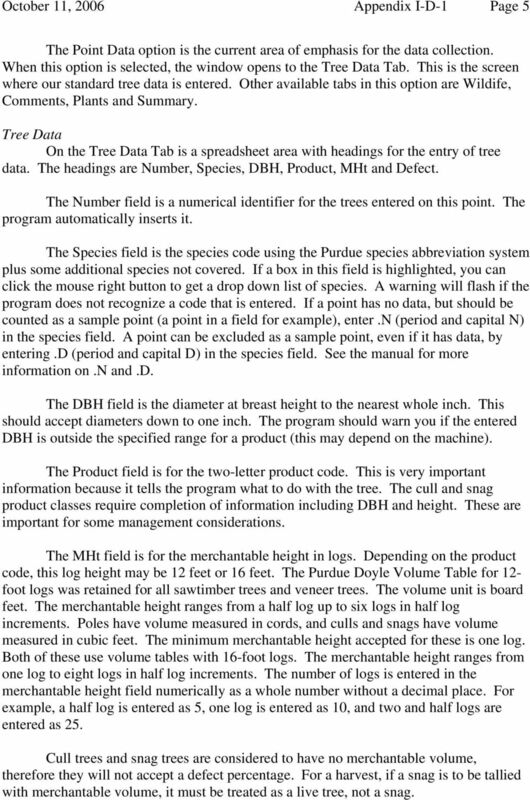 12 October 11, 2006 Appendix I-D-1 Page 12 The easier method if using sequential point numbers is available on the Tree data screen. The lower line of white letters on black give several options for the F keys. F4 will set up the next sequential point number, ready for data entry. The stand number will be the same as the previous point. The F3 key will bring up the previous point data, which can be added to or corrected. If desired, the assignment of points to a stand can be done in the office on Office Dog after all field data is collected and downloaded. The fifth option in Main Menu is Calculate. This will calculate very basic information and statistics. The sixth option in Main Menu is Setup Menu. This is for making changes in the settings and method. This should not be changed as it can affect data. 13 October 11, 2006 Appendix I-D-1 Page 13 Indiana State Forest Method Set Product list VL Veneer (prime) leave VH Veneer (prime) harvest SL Sawtimber leave SH Sawtimber harvest QL Quality Sawtimber leave QH Quality Sawtimber harvest PL Poles leave PH Pole harvest CL Cull leave CH Cull harvest NL Snag leave NH Snag harvest AL Sapling leave AH Sapling harvest Veneer trees is a misnomer. 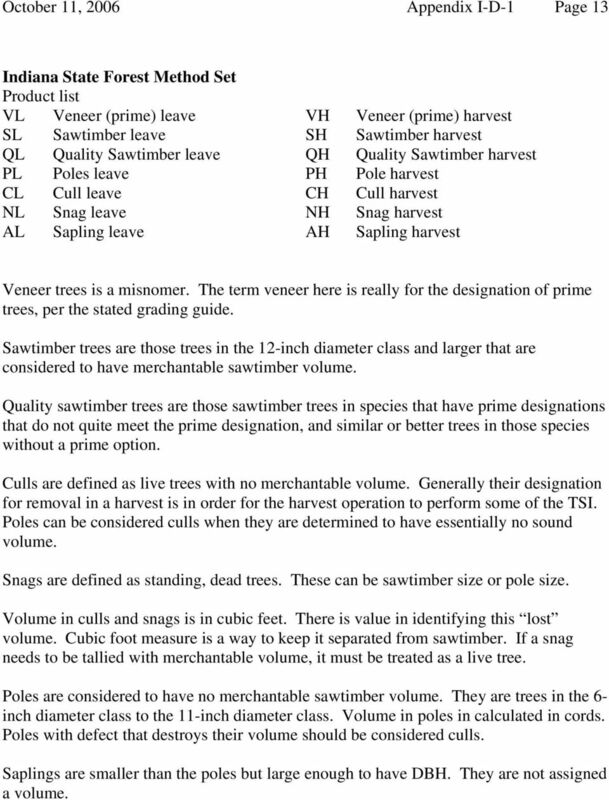 The term veneer here is really for the designation of prime trees, per the stated grading guide. Sawtimber trees are those trees in the 12-inch diameter class and larger that are considered to have merchantable sawtimber volume. Quality sawtimber trees are those sawtimber trees in species that have prime designations that do not quite meet the prime designation, and similar or better trees in those species without a prime option. Culls are defined as live trees with no merchantable volume. Generally their designation for removal in a harvest is in order for the harvest operation to perform some of the TSI. Poles can be considered culls when they are determined to have essentially no sound volume. Snags are defined as standing, dead trees. These can be sawtimber size or pole size. Volume in culls and snags is in cubic feet. There is value in identifying this lost volume. Cubic foot measure is a way to keep it separated from sawtimber. If a snag needs to be tallied with merchantable volume, it must be treated as a live tree. Poles are considered to have no merchantable sawtimber volume. They are trees in the 6- inch diameter class to the 11-inch diameter class. Volume in poles in calculated in cords. Poles with defect that destroys their volume should be considered culls. Saplings are smaller than the poles but large enough to have DBH. They are not assigned a volume. Diamante WiFi Wireless Communication User Guide Linksys E1200 Release: February 2012; August 2011; February 2011 Patent Pending. Copyright 2012, Stenograph, L.L.C. All Rights Reserved. Printed in U.S.A. CONTENTS TA920 V2.0 Attendance System Hardware Suite Guide Instructions Manual Chapter One - Introduction 1.1 Communication Port 5 1.2 Power Source Control. 5 1.3 Attendance Users. 6 1.4 Registering Ways..
Print: 09/11/2007 Page: 1/6 Multicam 8.04.33 Installation guide Table of Contents 1. INSTALLATION ON MTPC A1/A2 (A1, A1/R, A1/R2)... 2 1.1. DOS 6.22 OPERATING SYSTEM... 2 1.2. MULTICAM SOFTWARE... 2 1.2.1.